is the new Canadian National Amateur MMA 185 pound Champion. We were in Lethbridge, Alberta May 27th - 29th at the Canadian Combat Alliance Canadian National Team Trials. 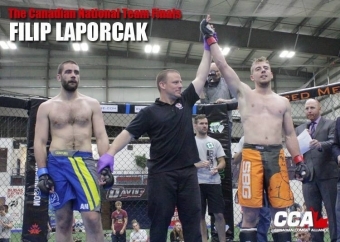 With Filip winning the Ontario Provincial Championship in April, he qualified to fight for a place on Team Canada. We had a bye on Friday, which is not something we enjoy as we come to fight, but that’s the way it goes. Saturday we had a tough opponent who had some heavy hands and a strong clinch game. Filip ended up against the cage for most of the first round. He wasn’t in any real danger, but he did take some knees. Collected himself between rounds and put our strategy into effect. Right off the bell he landed a nice head kick, that although was blocked some, did some damage. Followed it up with a beautifully timed front kick that dropped his opponent. He followed up with some hands on the ground and the referee stopped the fight at 11 seconds into round 2. This got us into the finals on Sunday, where Filip would have to win against the current National Champion Colton Boxell, who had a record of 6-1, with his only loss coming at last years World Championship. So Saturday night we went over our strategy, and prepared for a tough fight. I watched video on Colton, and after seeing what he does, came up with our strategy. Colton is a southpaw, a phenomenal grappler, doesn’t throw many strikes and I felt that he did not like to get hit. To beat him I talked to Filip about some things I thought would be the keys to winning. No crosses until Colton is weakened or hurt as he shoots off of everyone’s cross, lots of jabs, shorten up the punches, fakes the cross and land hooks and uppercuts. Regarding grappling him, heavy hips on the sprawl, smash his head down, and do not go for the choke, use the cross face instead and circle to the back and ground and pound. Filip executed the game plan beautifully. Colton had a very hard time getting Filip down, and even when he managed to it wasn’t for long as Filip was right back to his feet. Round 1 saw a lot clinch action. Round 2 Filip grew even more confident as Colton could not get the takedowns he wanted, and Filip started to really punish him with strikes. Filip finished the round so strong, Colton was tiring, and I could see the end was coming. Round 3 opened up with Filip landing a fast and powerful hook/cross combo that rocked Colton. Filip got him down, took top position and unloaded a barrage of punches that made the referee step in call a stop the fight. Filip wins by TKO to become the new Canadian National Champion. With this win, Filip is now 5 - 0 in Amateur MMA, Ontario Provincial Champion, and Canadian National Champion. Now we head to Las Vegas July 5 - 10 for the World Championships. There will be 257 athletes from 40 countries participating. To say we are excited is an understatement.